Callie and Peter met their freshman year of high school in Spanish class. Callie was struggling with the class, and Peter was making perfect scores on all of his assignments. He sat behind her and would help her out, and as they got to know each other, Callie says that he would start to ask her questions too, like, “what’s on the test again?” She knew that he knew what was on the test, because he made perfect scores on everything! He was looking for an excuse to talk to her, and he finally asked her to the movies, and they have been together ever since! We love stories like that so much! It reminds us a little bit of our own! We love when immature, puppy love can grow with a couple as they grow into adults. Callie and Peter’s wedding will definitely be a long time coming (more than 9 years, in fact! 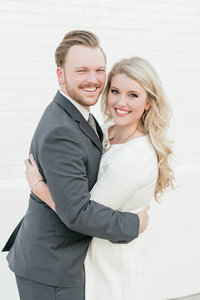 ), so we’ll be cheering for them when they finally say “I do!” These two will tie the knot at St Stephen’s Episcopal Church in Vestavia Hills, Alabama and then party the night away at The Florentine in downtown Birmingham! It’s going to be amazing! Love all of these. Sweet, intimate moments captured.